It’s a classic battle: lace-up work boots vs slip on work boots. 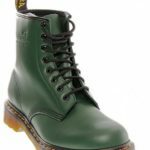 Which boots should you buy? Although one isn’t necessarily better than the other, lace-up work boots fit more securely than pull-on models. Lacing them up allows you to adjust the shoe to your foot as tight as you feel comfortable. We’ve reviewed the top-rated lace-up work boots for both men and women so that you can purchase your next pair with confidence. 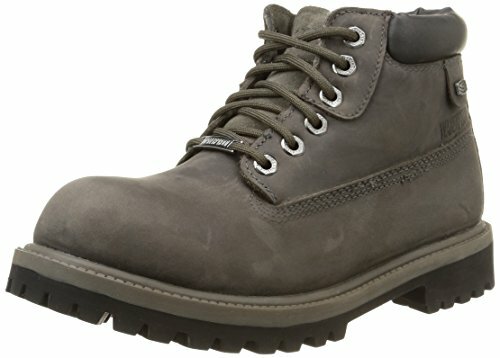 Timberland is a renowned company, famous for their line of safety work boots. The Timberland PRO Direct Attach 6” Steel Safety Toe Waterproof Insulated Boot is one of their most popular models with good reason. Designed for a variety of work conditions, this 6” ankle work boot has a waterproof leather upper to keep your feet dry while working in wet environments. The synthetic rubber outsole has excellent traction to keep you safe in uneven terrains. The steel toe of the Timberland PRO follows safety regulations, but Timberland made this insulated work boot for comfort. A nylon diffusion plate in the sole provides shock absorption, and the memory foam insole cushions your foot during long work days. A mesh liner allows your feet to breathe in this insulated work boot while keeping your feet warm during colder temperatures. If your feet do sweat, antimicrobial protection keeps odors away. Metal-reinforced grommets help with smooth and sturdy lacing, adding stability to your foot and ankle. There have been some minor reports of quality issues, such as the waterproofing failing and the boot falling apart within a year of use. 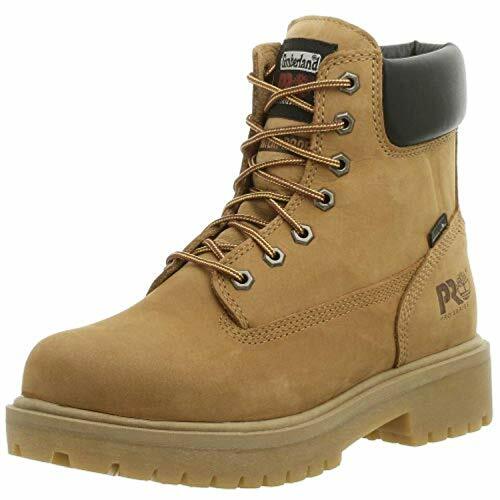 However, the Timberland PRO Direct Attach 6” Steel Safety Toe Waterproof Insulated Boot’s comfort make it our choice for the best men’s lace-up work boot. Any woman in the labor industry will tell you it can be nearly impossible to find quality women’s safety boots. Most end up buying men’s styles, hoping they will fit. 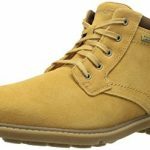 Timberland, one of the leading manufacturers of work boots, understands this, and they have options of work boots designed with the woman worker’s comfort in mind. The Timberland PRO Women’s 88116 Rigmaster Work Boot is a 8” midcalf boot has a durable leather and textile upper with reinforced grommets and lace hooks for a secure fit. The slip-resistant rubber outsole has a 1.25” heel and a 0.75” platform for shock absorption, and it has durable tread for reliable traction. The Ortholite insole is designed to reduce fatigue in your feet for long days of walking and standing. Its composite safety toe passes safety standards, making this waterproof boot ideal for women construction workers. The Timberland PRO Women’s 88116 Rigmaster Work Boot is for women with smaller feet. It runs small and narrow, and the 9” opening may be too small for women with larger feet to slide into the boot. The quality construction makes the boot a little heavy, but you will get used to their weight easily during the mild break-in period. Some women with defined arches find that the boot doesn’t have enough arch support, but an insert can fix this problem. 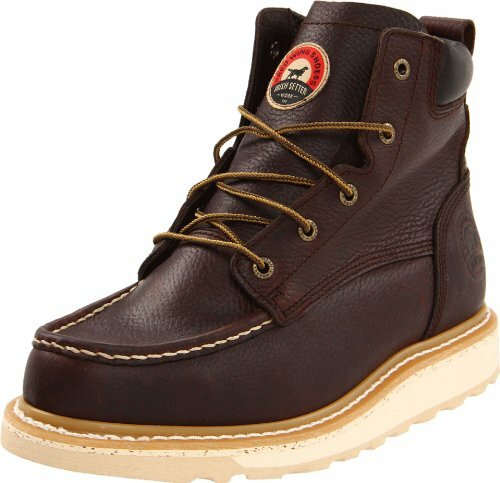 Although Timberlands generally run on the higher end of the price point for work boots, their comfort and durability make them some of the best work boots on the market. The Timberland PRO Women’s 88116 Rigmaster Work Boot is our choice for the best women’s lace-up work boot. Skechers are a reliable brand in all types of footwear, and they have recently increased the presence in the work boot market. The Skechers Men’s Verdict Boot is a moderately-priced 5” ankle work boot that provides good traction and shock absorption. With a wide toe box and a removable insole, the Skechers Verdict are great for standing or walking for long hours. The metal grommets keep your laces secure for a good fit, and they keep the holes from snapping. The boot does not have a safety toe, so they aren’t suitable for some work sites. They are water-resistant (not waterproof); the boots will hold up in a rainstorm, but they aren’t meant for extremely wet conditions. You will have to order a size up from your normal footwear, as they run small and narrow. The stiffness of the leather and the insole requires some breaking in, and they tend to fall apart faster in outdoor environments. However, the Skechers Men’s Verdict Boot is a comfortable option for factory work or other indoor professions. Irish Setter has been creating quality hunting boots since the 1950s. Upon the advertisement of their original Irish Setter model, American workers quickly found a durable and comfortable boot that kept up with the demand of their jobs. The company has since released their own line of work footwear. 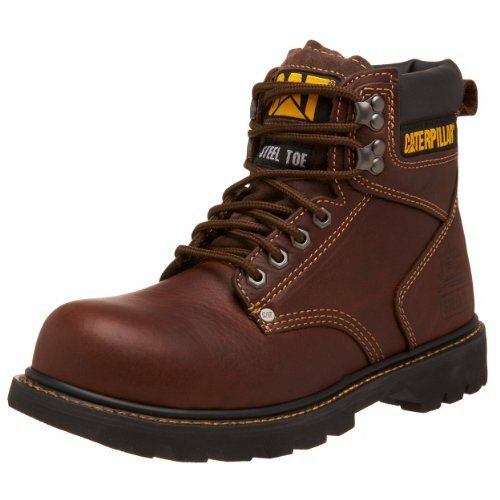 The Irish Setter Men’s 6” 83605 Work Boot has a full-grain leather upper and an ASTM-certified soft toe boot that meets safety standards. They have a removable polyurethane insole and a rubber outsole with great traction. The Irish Setter holds up to rough terrains, and they protect your feet while you are working. This comfortable 6” ankle work boot has brass eyelets that hold up to rough and quick lacing. Unfortunately, they aren’t slip-resistant, and their lack of a steel/composite toe make them a poor option for some work environments. The Irish Setter has a narrow toe box, and they run small and wide. They are better for men with short, wide feet. Although they are an expensive work boot, they hold up well due to their craftsmanship. Known for their large work equipment, Caterpillar has extended their line of work accessories to footwear. The Caterpillar Men’s Second Shift 6” Steel Toe is a comfortable work boot that stands up to the most intense work environments. A full-grain leather upper and a Goodyear welt rubber sole protect your feet from the elements. This 6” slip-resistant ankle boot has a safety heel for climbing ladders and an ASTM-certified steel toe accepted on almost all work sites. Although it has a high price point, the Caterpillar Second Shift support your feet all day long. A platform sole and defined heel increase shock absorption. The padded collar and breathable sockliner keep your feet comfortable. Caterpillar included metal grommets for lacing that will last for years. There is a mild break-in period for the leather to stretch and bend to your movement. These boots run large, so you’ll need to order a size down from your regular boot size. The only real downside to these boots is that the insole isn’t removable, but the boots are so comfortable that you won’t need another insert. Despite some occasional customer reports that the boots fall apart within a year, the Caterpillar Men’s Second Shift is a sturdy work boot made for long days on your feet. 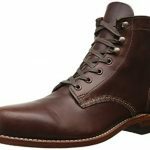 Thorogood is a partner of the Weinbrenner Shoe Company, a United States company in business since the end of the nineteenth century. Weinbrenner introduced many of the safety features available in work boots today. The Thorogood Men’s American Heritage 6” MOC Toe, MAXwear Wedge Non-safety Toe Boot is a breathable work boot with a sturdy construction. 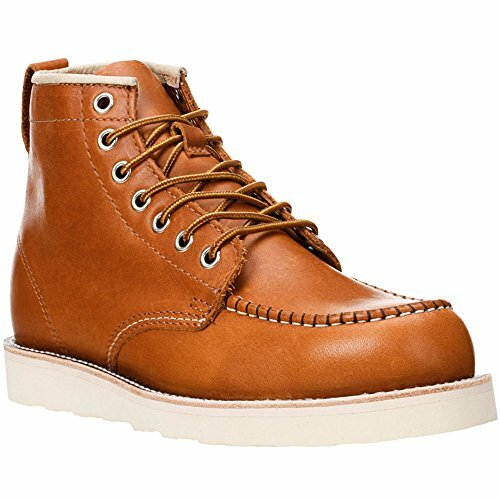 The leather upper and the MAXwear wedge Goodyear welt rubber outsole contribute to the boot’s durability. With metal grommets, the lace hooks hold up to rough lacing. Designed for comfort, a fiberglass shank in the sole stabilizes your foot when you walk. The dual-density insole provides shock absorption for the most sensitive parts of your foot. It is removable, in case you require a specialized insert or an orthotic. The Thorogood Men’s American Heritage 6” MOC Toe, MAXwear Wedge Non-safety Toe Boot has a mild break-in period, but customers report that they are extremely comfortable afterwards. They run large but narrow, so they are best for men with thin, long feet. The arch support is lacking in the boot, but inserting a gel insert can take care of this issue. Although the American Heritage isn’t slip-resistant, they are good for outdoor jobs, such as excavation, logging, and ironworking. 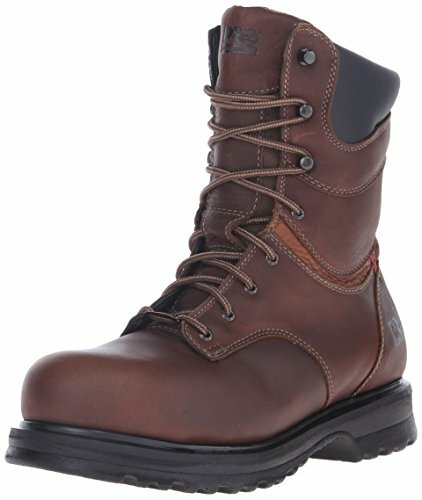 The quality of the construction of the boot makes them expensive, but some claim that they are the most comfortable work boots you will ever wear. Täos is a women’s shoe company that creates quality casual, athletic, and work footwear. 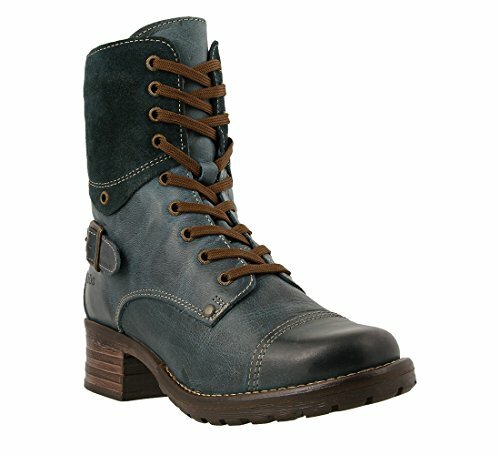 The Täos Women’s Crave Boot is a 7” mid-calf work boot designed with women’s comfort in mind. With a leather and suede upper, this lightweight boot has a flexible synthetic sole with a 0.5” platform and a 2” safety heel for shock absorption. The company focuses on comfort: their polyurethane dual-density insole forms to your foot, but it is removable for orthotics. A faux fur lining keeps your feet warm in cold conditions. To help obtain the best fit possible, the boot has an inside zipper and an adjustable rear buckle above the heel. Reinforced grommets make lacing this boot a breeze. The Täos Women’s Crave Boot is available in multiple colors, but they run narrow and small. The 10” opening may be difficult for women with larger feet to slide into the boot. Unfortunately, they do not come in wide sizes. They are only water-resistant, so they aren’t best for extremely wet conditions. This expensive work boot doesn’t have a safety toe, which may be problematic for some work sites. 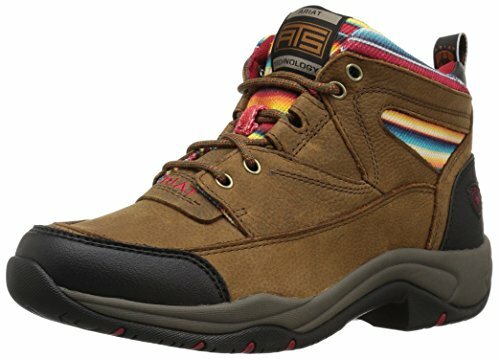 The Täos Women’s Crave Boot is a great work boot for women who work in tough conditions. Let’s face it: most safety work boots have a standard design that borders on ugly. Who says you can’t look good while you are working? The Dr. Martens Women’s 1460 W work boot is a stylish 7” midcalf work boot that comes in multiple models. The synthetic leather upper is long-lasting, and the boots have a roomy fit with an AirWair comfort insole for great bounceback. The slip-resistant sole has a 1” platform for more shock absorption, reducing foot fatigue. 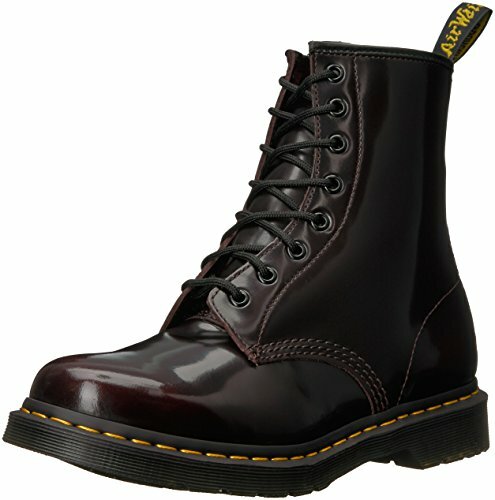 The Dr. Martens Women’s 1460 W isn’t waterproof, so they aren’t meant for extremely wet conditions. They run narrow with a tight toe box, so women with wide feet should order a size up. There is a mild break-in period for the upper, but they should stretch within a few wears. The 1460 doesn’t have a safety toe, but they are a trendy and comfortable work boot for indoor workers. 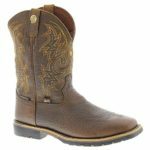 Ariat is a shoe company known for their equestrian footwear, but they also design quality work boots for men and women. The Ariat Women’s Terrain Work Boot is a lightweight 3.5” ankle boot with a safety heel and a 0.75” platform manufactured for safety on the work site. Its full-grain leather and textile upper protects the top of your feet from spills, and the Duratread rubber outsole has great traction for safety. 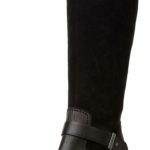 Most importantly, Ariat designed these boots to be extremely comfortable for women’s feet. The four-layer footbed with an internal shank stabilizes your feet as you walk, relieving foot pain. A moisture-wicking liner pulls moisture away from your foot throughout the day. If you need more support for your feet, the insole is removable for another insert or an orthotic. Although the Ariat Women’s Terrain Work Boot doesn’t have a safety toe, it has a bumper to save your toes from injury. Only some of the lace hooks have metal reinforcement, but they are strategically placed at the bottom and the top to keep the fit secure. The sole doesn’t have slip protection and the leather upper is water-resistant, so the boot isn’t ideal for extremely wet conditions. This moderately-priced work boot doesn’t hold up well after about a year of wear, but they are a comfortable pair of boots that support your feet during long work days. Skechers is one of the most well-known shoe manufacturers, building their reputation on a variety of designs. The Skechers for Work Women’s Workshire Peril Steel Toe Boot is a roomy ankle work boot welcomed on several work sites. The Workshire’s leather upper is durable, and the steel toe meets ASTM standards. A synthetic rubber outsole has excellent traction, with a 1” platform and 1.5” heel for shock absorption. This feature moves into the midsole, which is geared to diffuse impact throughout your foot to fight fatigue. The removable insole has memory foam gel, forming to your foot for excellent support. Although the memory foam is very comfortable, it doesn’t offer that much arch support. You can easily replace the insole with a more comfortable one catered to your needs. There is a mild break-in period: even after you get used to the boot, the ankle collar still fits a little tight. Some users have reported that the boot feels heavy. Despite these few issues, the Skechers for Work Women’s Workshire Peril Steel Toe Boot is a budget-friendly alternative to several other more expensive options. Men and women workers always seem to be on the hunt for the perfect pair of work boots. Either they are too uncomfortable, or they don’t follow safety regulations. There are boots on the market that fulfill both of these needs for both genders. In our review of the top-rated lace-up work boots, we’ve selected the top contenders for men and women, both manufactured by Timberland. The Timberland PRO Direct Attach 6” Steel Safety Toe Waterproof Insulated Boot is one of the most comfortable work boots that the company distributes. The Timberland PRO Women’s 88116 Rigmaster Work Boot provides the stability and safety features that hard-working women need on the job site. Safety at work begins with your feet, and your boots should reflect that. Just in case I haven’t convinced you to buy lace up work boots, we have a list of the Best Slip-On Work Boots, too. Lougee, Mary. “Safety Lace Up Boots vs. Slip On Boots.” Career Trend. 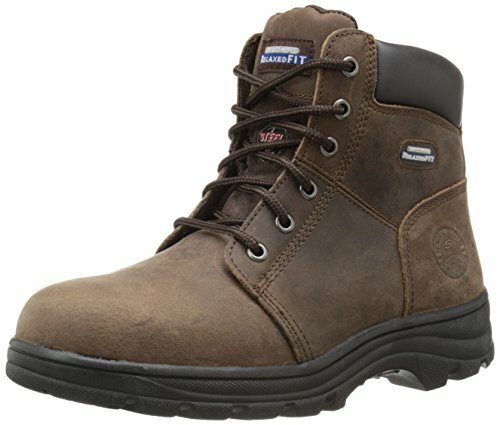 July 2015. https://careertrend.com/about-5387316-safety-boots-vs-slip-boots.html.